Xavor’s next-gen Cloud PLM Product Structuring Services enables companies to reduce time by enabling common data and business processes across the enterprise. 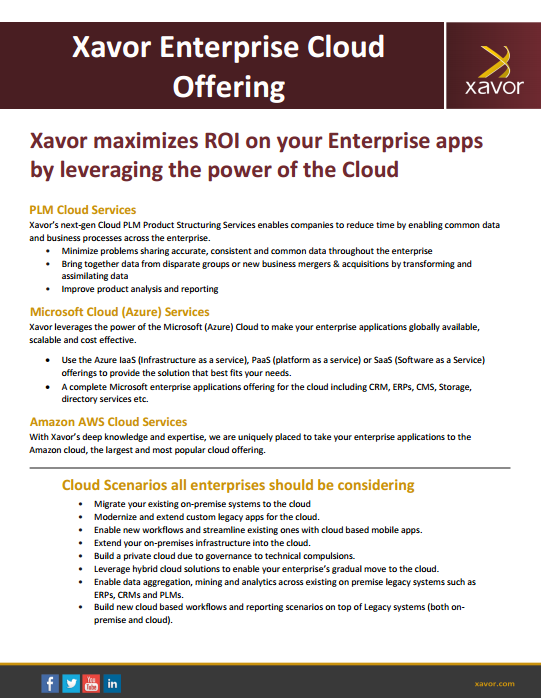 Xavor leverages the power of the Microsoft (Azure) Cloud to make your enterprise applications globally available, scalable and cost effective. Use the Azure IaaS (Infrastructure as a service), PaaS (platform as a service) or SaaS (Software as a Service) offerings to provide the solution that best fits your needs. A complete Microsoft enterprise applications offering for the cloud including CRM, ERPs, CMS, Storage, directory services etc. With Xavor’s deep knowledge and expertise, we are uniquely placed to take your enterprise applications to the Amazon cloud, the largest and most popular cloud offering. Modernize and extend custom legacy apps for the cloud. Enable new workflows and streamline existing ones with cloud based mobile apps. Extend your on-premises infrastructure into the cloud. Build a private cloud due to governance to technical compulsions. Leverage hybrid cloud solutions to enable your enterprise’s gradual move to the cloud. Build new cloud based workflows and reporting scenarios on top of Legacy systems (both on-premise and cloud).